I am a fan of foraging for mushrooms around our cabin site. There are literally hundreds of different kinds of mushrooms that grow here. 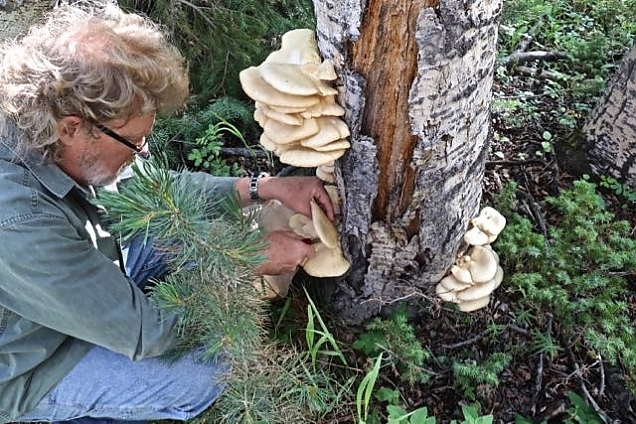 We've found 3 that we can forage as edible (and hope to find more over time). 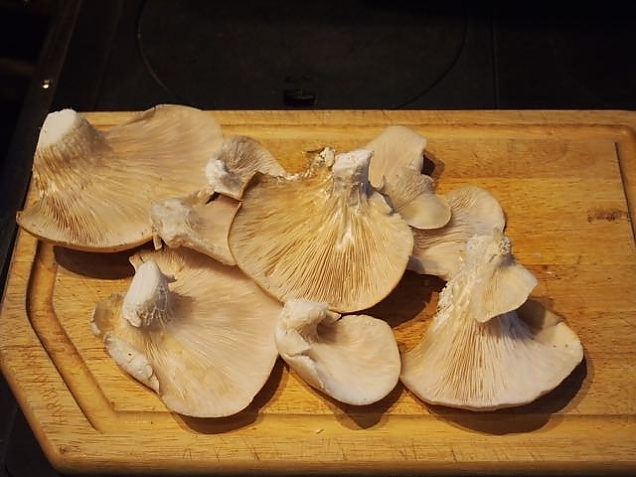 One of those is the oyster mushroom. 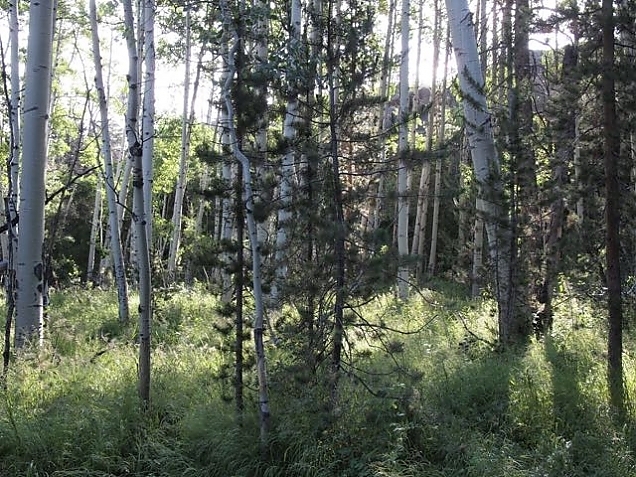 It grows on dead aspen trees in cool wet areas like the picture below. 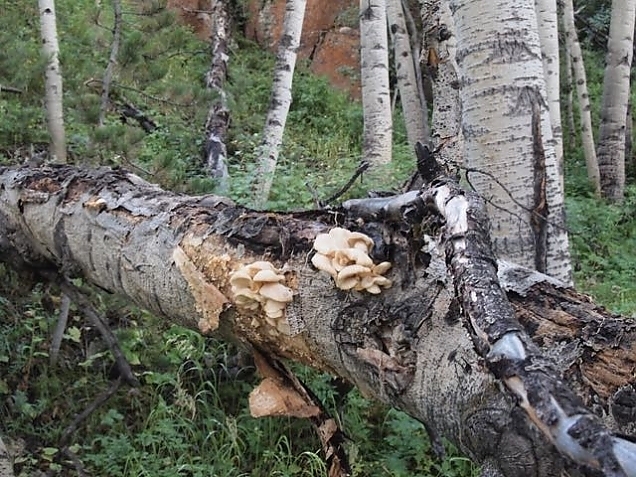 The other day when Lynne and I were hiking below the cabin at a place we call Picnic Rock, we noticed a few oyster mushrooms on a large dead and fallen aspen tree. I had no way to collect them at the time, and there weren't many, so we left them. 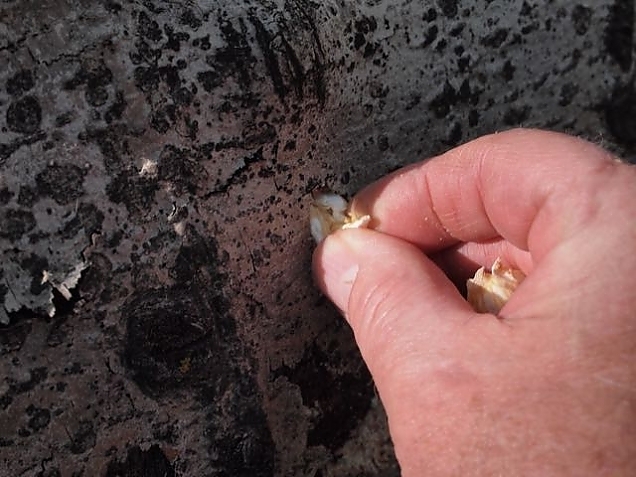 But, I decided to go back down this morning with my power drill and do some "plugs" to propagate the mushrooms. 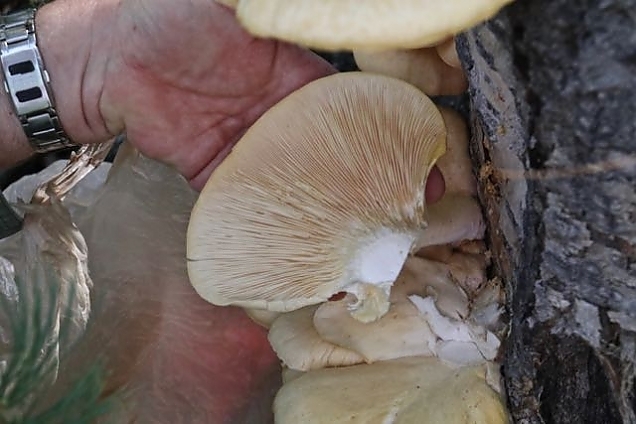 Turns out if you drill a hole in a dead host tree (aspen in this case) and then fill the hole with some existing fresh mushrooms, a new cluster of mushrooms is likely to grow at that site. 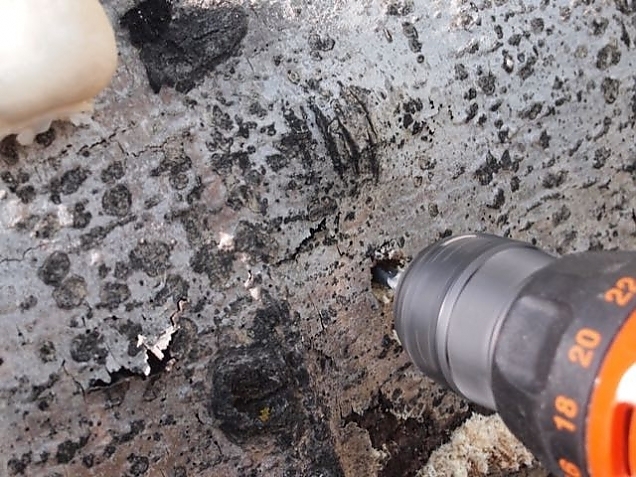 Here I am drilling hole in the downed, dead aspen. And, plugging it with some mushroom picked elsewhere on the tree. 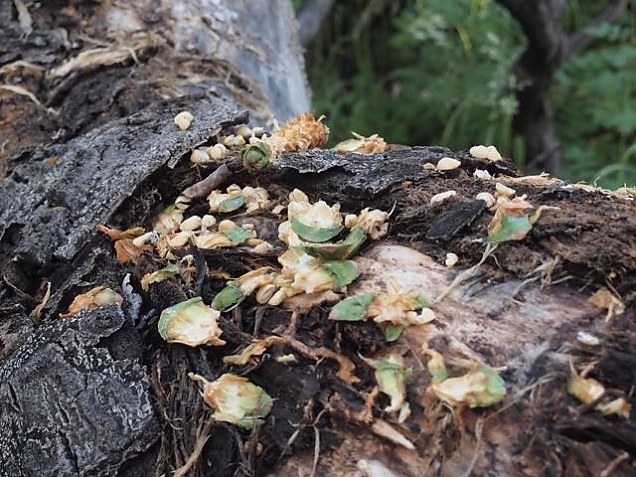 The squirrels had been busy eating green pine cones on the same tree. 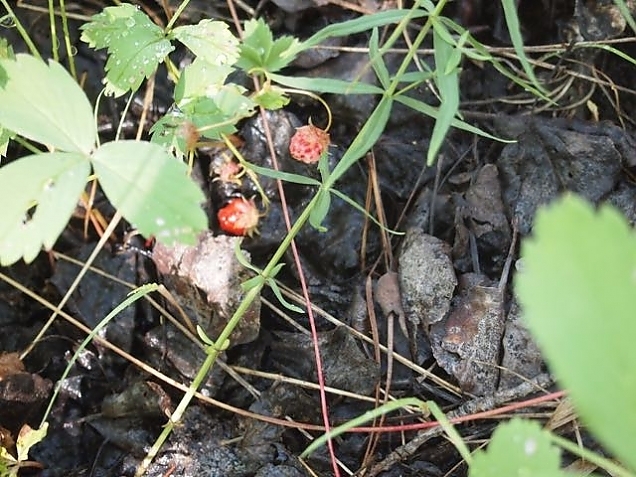 And, I picked and ate a few wild strawberries before turning to head home. 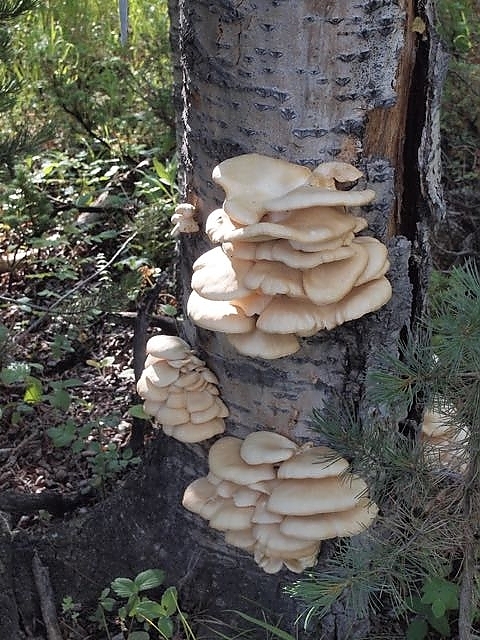 After I turned back toward the cabin, I spotted more mushrooms growing on a different tree that I had not seen earlier. 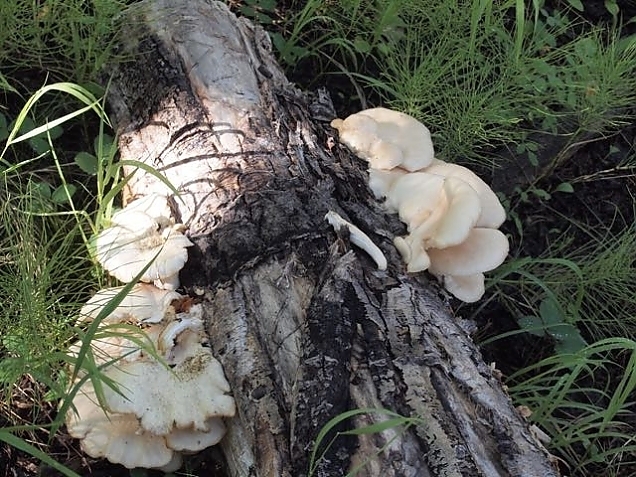 As I walked to that tree, I saw another stump literally covered with mushrooms! I guess I did not need to try manually propagating them. There are more here than we can ever use! And, they were fresh and ready to cut. 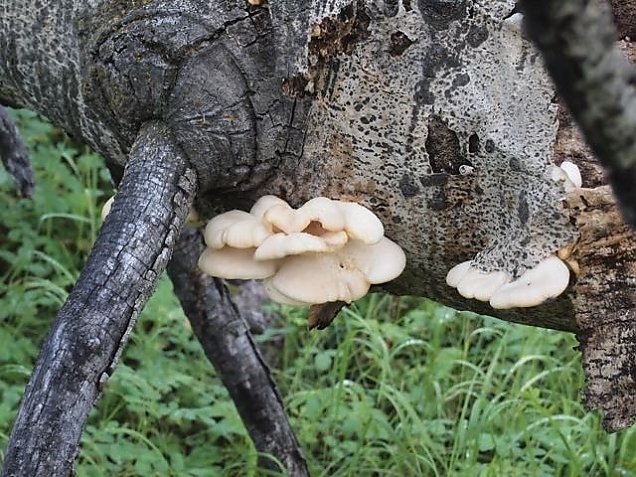 Oyster mushrooms are attractive to bugs as well as mycophagists, and even if they are a few days old they can get infested. Most of these were in perfect shape. So, I came back up to the cabin, got Lynne, a knife and a bag and headed back down. She took these two photos of me cutting a few of the nicer ones. Here are just a few of what I cut. I've put the word out to neighbors that I have these and more to see if anyone want some. If not, I'll blanch about half of them in boiling water for a couple of minutes, let them dry out real well, then freeze them in a ziploc bag. The ones we don't freeze will go into some kind of dish within the next day or two. (I store them wrapped in damp paper towels in a paper bag in the warmest part of the refrigerator. They'll keep for a week that way.) Maybe sliced and breaded and fried? Maybe in an Asian-flavored stir fry with some steak and veggies? Maybe in an omelette or frittata? Suggestions?